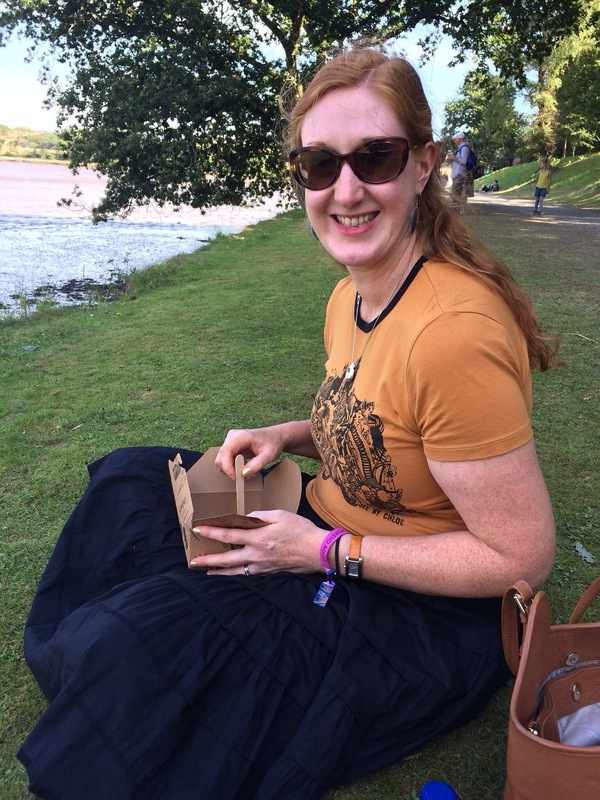 The Port Eliot festival is one of my favourite events of the year. Held in a beautiful country estate in Cornwall, it’s a weekend filled with books, music, food, gin and general jollity. It’s impossible not to find something to inspire you, and although it’s exhausting having so much fun it’s also inspiring (and I came home with a large pile of books to read). I even heard some comedy I found funny – Shappi Khorsandi (I don’t usually enjoy comedy). There are always small tragedies of the writers you don’t get to hear because they clash with something else you simply must do – but I’ll try not to dwell on that! I won’t test your patience with a rendition of my notebook, but instead will just go through a few highlights. First, music. I went to a singing workshop run by the Chaps Choir, where we sang gospel songs, a Finnish reindeer call, and a great arrangement of The Magnetic Fields’ ‘The Book of Love‘. I love to sing, and this has really inspired me to go and find another choir; I haven’t stopped singing since (especially as we got to perform the song in St Germans Church on Sunday). 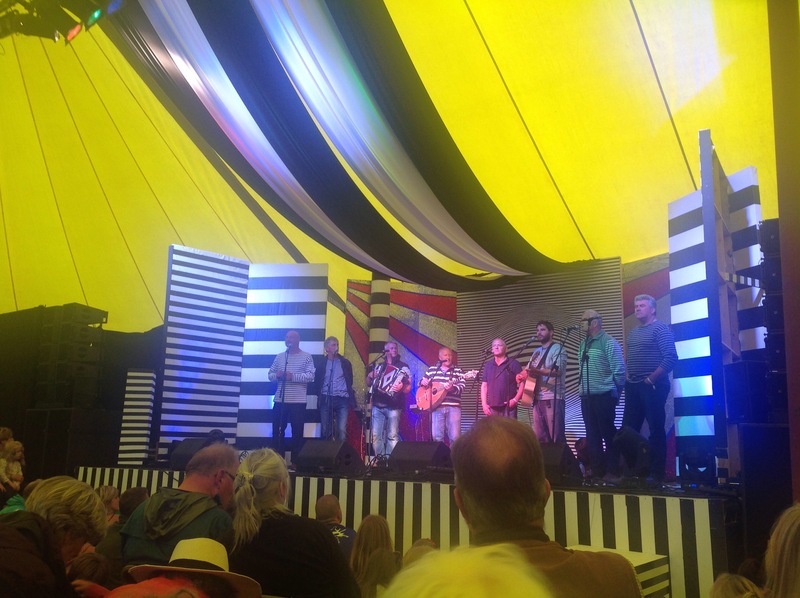 The singing was also inspired by hearing Fishermans Friends, the Port Isaac group who sing sea shanties (and drink beer and laugh whilst singing). 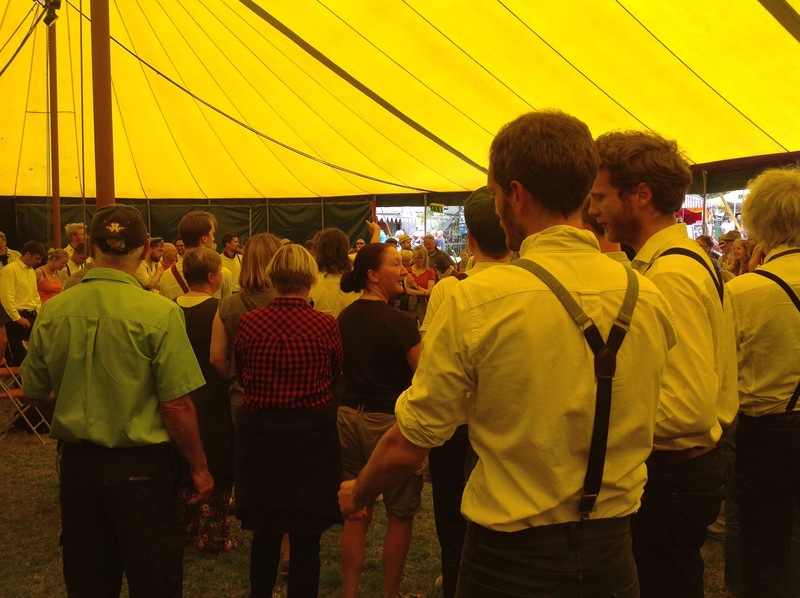 I love the shanties, and sing them with my son, who would have loved their show, which had everyone singing along. We also heard Stealing Sheep, and the Unthanks, who were great in concert (‘The Testimony of Patience Kershaw‘, with its socio-historical roots, especially appealed to me). The writers I heard included Rachel Holmes talking to Shami Chakrabarti about her forthcoming book on Sylvia Pankhurst. I’ve bought her previous book, on Eleanor Marx, and even had a quick chat to her about the nature of feminist biography, and the Pankhurst book should be a good addition to the canon of works on the Suffragettes. Next, I listened to Laura Barton talking about music and sadness – how we bring our own sadness to music we listen to, but how music can also be a way out of sadness, a concept echoed by Matt Haig the following day, talking about reading and writing as a way out of depression, perhaps because it forces us to externalise our emotions and make connections. In the pouring rain we listened to Owen Sheers (whose book Resistance I have bought but have yet to read) talking about his new book, I Saw A Man, which I bought for my husband, as well as his diverse other projects including a film-poem commemorating the disaster at Aberfan. His comments on Welshness and poetry – that poetry is well-supported in Wales, perhaps better so than in England – interested me. As a complete contrast, we also heard Luke Wright performing his poetry; he’s a great performer, with poems about parenthood, suburbia, politics and failed dreams. 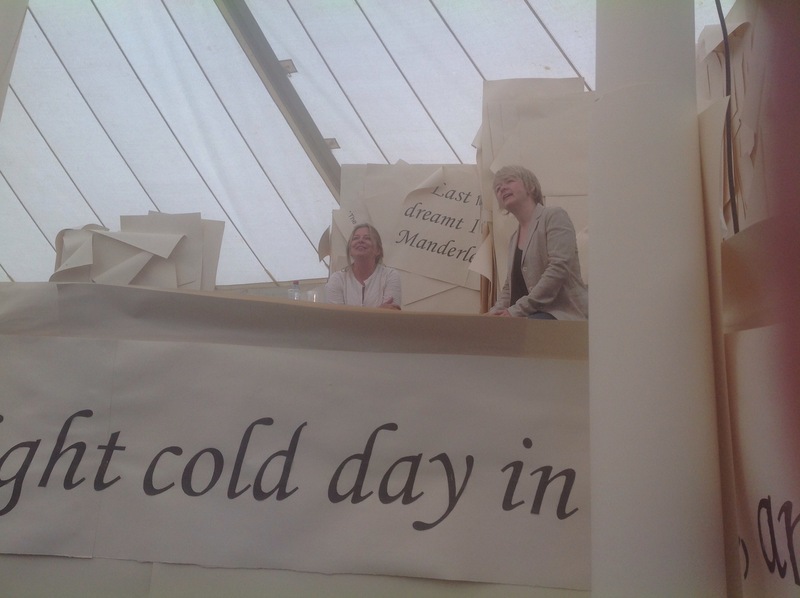 The biggest draws of Saturday were Sarah Waters and Simon Armitage, speaking to packed marquees (the strange angle of the photographs indicates that I was on the floor directly in front of the stage!) I enjoyed Waters’ talk, as I enjoy her novels (though her latest, The Paying Guests, is probably my least favourite). She talked about her research, the periods in history she is interested in (she plans her next novel to be set in the 1950s), and her apparent obsessions with houses, mothers and daughters, gender and class. In The Paying Guests she wrote about the Twenties because it was a period she knew little about, and intentionally undermined the stereotype of the Roaring Twenties, instead focusing on the class conflict and quieter lives of those bereaved after the war. Her interests are often in ordinary lives disrupted by extraordinary events, rather than extraordinary characters. I’m interested to hear that The Little Stranger is to be made into a film and The Paying Guests a TV series. Simon Armitage, recently elected Professor of Poetry at Oxford, has a refreshingly down-to-earth approach for one of the most famous (living) British poets, He talked about his books Walking Home and Walking Away, in which he walked first the Pennine Way and then the South coast, ‘testing poetry’, as he put it – giving readings along the way to support himself, and asking what payment people felt he deserved; though he is an optimist about poetry, he felt that he should take poetry to people to see their response, and on the whole he seems positive about this (again, I have both books but haven’t yet read either!) The extracts he read are not only poetic but humorous too, and suggest that both in the people he met and in the landscape itself he found, unexpectedly, a strong and positive sense of Britishness. I managed to catch some of a conversation between the sculptor Alice Channer, Nicholas Serota of the Tate, and Chris Stephens, focusing on Barbara Hepworth, the subject of an exhibition at the Tate currently. I was particularly interested in Channer’s comments about how Hepworth makes a solid, hard material look somehow elastic, as though she has changed its very nature in the process of her work. The relationship of people and places to sculpture is something the exhibition has encouraged me to think about too, and the three of them in conversation on Hepworth were inspiring. Finally, I was especially inspired by a discussion between Philip Marsden and Tim Dee. Both nature writers (or travel writers), they discussed, among other things, how we use language to construct nature, poetically, socially, historically, and these days politically and ecologically. This is, of course, to nature’s complete ignorance of it: a blackbird has no idea it is a blackbird, or that we have all kinds of cultural connotations of blackbirds; it just is. Obvious but needing stating, I think. And the naming of nature is itself a colonial project, they suggested, implying our dominion over it in a way which is uncomfortable. I’ve only recently become interested in ‘nature writing’, so was fascinated by their discussion about ‘the new nature writing’ – particularly around the resurgence of interest in it which is, perhaps, stemming from our disconnection with nature in the modern world, as well as a desire to capture what seems to be a vanishing world (though both of these have been the impetus for much nature writing for centuries). It’s also politically motivated, very often, though, raising awareness of the changes in ecosystems, threatened species, etc; we are looking into the abyss. 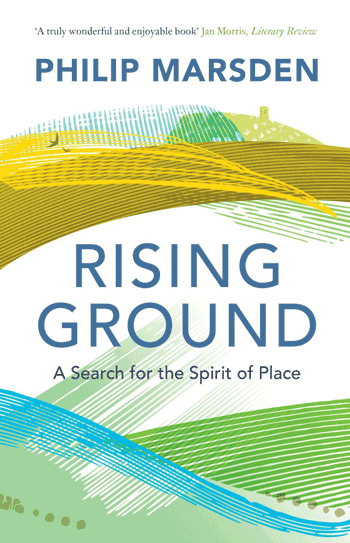 I’ve bought Marsden’s book Rising Ground, on the ‘spirit of place’ in Cornwall as a way of thinking about how we connect to the landscape more broadly, and how this gives both individuals and cultures meaning. It’s yet another book I can’t wait to read!